Lauralee’s family had struggled with having food to eat when she was younger; she recalls growing up in home where the cupboards were bare. She remembers visiting a friend’s house and seeing their pantry and coming home telling her mother that her friend’s family owns the grocery store because she had never seen a pantry that full. She also recalls an evening when her dad came home holding a single can of soup, set it in the middle of the table, and walked away. At the time, she thought her dad was upset with her siblings, her mother, or even her. Years later, after they were grown, her mother shared that her father had actually not eaten in three whole days and he couldn’t possibly stay in the room and watch his four children and wife share one can of soup while he continued to starve, so he walked away. After witnessing hunger first-hand and fighting through it with the help from others, she was inspired to help others that may be currently walking in the same shoes she once walked in. 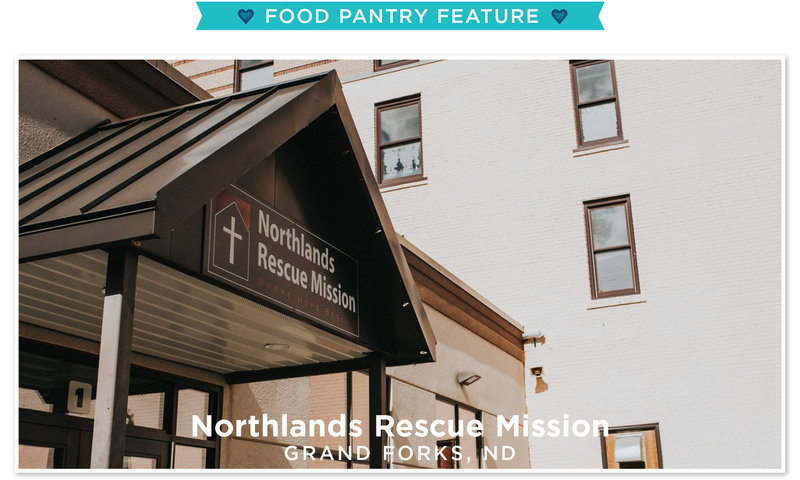 Northlands Rescue Mission, Grand Forks’ food pantry, serves 23 communities in the area. The food pantry doesn’t have an exact count on the number of families they help but they estimate helping about 17% of the people overall in the communities; distributing around one ton of food per week. There has been an increase in usage over the past year as well as an increased use of their Backpack Program. The Backpack Program sends home bags filled with food for children over the weekend and school breaks. They reach on average 20,880 children per year through the program. The mission does a lot more than just donate food, sometimes, they can help change lives. There was a family that had 7 children in the area that were struggling to make ends meet while the father looked for a job. The process, as many of us know, can take time. There is a place in town where potatoes can be purchased for $5.00 per 10 pounds. The family had been eating those potatoes for breakfast, lunch, and dinner for two weeks. The Mission donated a bunch of food to help the family until the father secured a job. The family lived in a poor community and decided to help other families as well, by donating some of the food they received to their neighbors. The father now has a job and the family is doing much better. Every Christmas the mother makes desserts and brings them to the Mission as a way of paying it forward. In order to make stories like this happen, the Mission looks to the community for support in donations. Local citizens, restaurants, churches, schools, and various other businesses are what help the Mission and its volunteers help others. The Mission is currently in need of condiments, soups, rice/pasta, fresh fruits and vegetables, oatmeal, crackers, fruit snacks, and aluminum foil. The Mission helps so many people in the community—one individual story isn’t what makes an impact, they all do. When the staff and volunteers walk around during supper and hear stories of the people they are helping get back on their feet, that’s the best “feel good” moment there is.